A lady at the track can sometimes feel intimidated to place a bet on the horse she loves. This simple, easy, beginner’s guide should help her feel comfortable and confident enough to place a bet on a horse race. 1) There isn’t anything more reliable than a woman’s intuition. Go with your gut woman! Pick the racehorse you fall in love with or the jockey wearing your favorite tangerine color. At this very moment, listen to your heart, not what the odds are. Trust your instinct and believe in your horse. 2) Never ever place a bet with your lover’s money. This is bad luck and only complicates things if you win big. Always have a set limit on the amount of money you’re willing to “spend” at the track. This will eliminate the “must win it back” mentality. 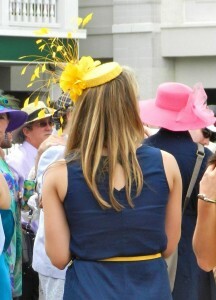 Placing a wager at the 2012 Kentucky derby. There are usually multiple horse races being simulcast so it is very important to specify the track name. You can place a bet on any race at any time of the day before the race is run. Now you can find Self Automated Mutuels with touch screens that will accept cash vouchers, a winning ticket, or a $20.00 bill. This is an easy way to bypass long lines with the tellers and place your bet quickly. Placing a bet with the SAM machine also alleviates any anxiety you may feel as a first time better at the horse track. There are three types of single horse bets that usually require at least a $2.00 minimum bet. WIN– You’ll win if your horse finishes in 1st place. PLACE– You’ll win if your horse finishes in 1st or 2nd place. SHOW– You’ll win if your horse finishes in 1st, 2nd, or 3rd place. a) “Churchill. $500 on #3 to Show.” If my #3 horse finishes in 1st, 2nd, or 3rd place I win! b) “Santa Anita. $500 on #3 to Win.” If my #3 horse finishes in 2nd, or even 3rd, I win nothing. I’ll only win something if he finishes in 1st place. c) “Belmont. $500 on #3 to Place.” If my #3 horse finishes in 1st or 2nd place I win! If he finishes in 3rd I win nothing. EXACTA– The two horses you pick finish in 1st and 2nd place in the order you pick them. TRIFECTA– The three horses you pick finish in 1st, 2nd, and 3rd place in the exact order you pick them. SUPERFECTA– The four horses you pick finish in 1st, 2nd, 3rd, and 4th place in the exact order you pick them. *Note: You may hear these bets placed as “Straight Exacta” or “Straight Trifecta” or “Straight Superfecta”. It’s simply a more proper way to tell the cashier or betting attendant if you’re placing several different types of bets. Box betting is another way of placing a bet on an Exacta, Trifecta, or Superfecta bet except your horses do not need to finish in the exact order. Boxing will increase your odds of winning but will significantly affect the payoff amount. “Gulfstream. $2.00 Exacta BOX on #4 and #5.” If my #4 and #5 horse finishes in either 1st or 2nd place, I Win! But in most cases my winning would be cut in half compared to placing a straight bet. There are several other types of more complicated bets that we will explore in later posts. Be sure to check back for updates. Click here to safely place a bet online and support Lady and The Track.